In this WINIX 5300-2 review we provide you with all the details you need to make an informed decision as to whether this is the right model air purifier for you. No remote control . CADR rated for 360 sq…. The Winix 5300-2 Air Cleaner is an evolution of the popular 5300 model; it is designed to capture dust, pollen, pet dander, smoke, mould spores, VOC (volatile organic compounds) household odours, airborne pollutants, dust mites and other allergens. It has a CADR (Clean Air Delivery Rate) rating of 360 sq. ft. from AHAM (Association of Home Appliance Manufacturers). The WINIX 5300-2 uses a 3-stage air cleaning system, featuring an odour-reducing carbon filter, 99.97 percent efficient True HEPA filter and Winix PlasmaWave technology. Features include: 360 sq. ft. VOC Smart Sensor, air quality visual indicator, light sensor, auto and sleep mode, CUL listed, AHAM CADR (Clean Air Delivery Rate) certified, CARB certified (California Air Resources Board), Energy Star certified. PlasmaWave acts as a permanent filter to safely break down odour, allergens, chemical vapours and other pollutants with no harmful ozone. The WINIX 5300-2 uses a 3-stage air cleaning system, featuring an odour-reducing carbon filter, 99.97 percent efficient True HEPA filter and Winix PlasmaWave technology. Features include: 360 sq. ft. VOC Smart Sensor, air quality visual indicator, light sensor, auto and sleep mode, CUL listed, AHAM CADR (Clean Air Delivery Rate) certified, CARB certified (California Air Resources Board), Energy Star certified. The Winix 5300-2 Air Cleaner is ideal for home or office use. It is streamlined but has a powerful working action that removes from the smallest to the biggest pollutants from the air. It is quiet, so also ideal for bedrooms or childrens’ rooms and baby nurseries. Pets are also comfortable near it when it is in operation. This unit is particularly well-suited to medium to large living spaces, including kitchens. It will be particularly useful for anyone who wants a clean, healthy environment at home or at the office. The True HEPA filter captures 99.97% of airbone pollutants; including allergens as small as 0.3 microns. The delivered air flow is 236 CFM, decibels: 27.8. A Smart Sensor gauges the air and Auto Mode adjusts the fan to filter the air as needed. It has a sleep mode for silent night-time operation. It is CADR rated for 360 sq. ft. PlasmaWave acts as a permanent filter to safely break down odour, allergens, chemical vapours and other pollutants with no harmful ozone being introduced. 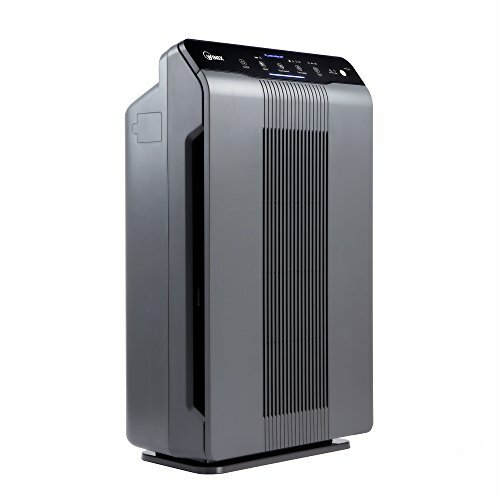 How To Use Levoit Winix 5300-2 Air Purifier? One of the salient features of the Winix 5300-2 Air Cleaner is its ease of operation. It needs no particular installation instructions. It just has to be unpacked, plugged in and switched on to start operating. In automatic mode, the unit senses the air and adjusts the airflow to clean the pollutants it detects. The unit will even tell the user when the filter needs changing. The Rabbit Air MinusA2 is the highest-rated air purifying system. It has a 6-stage process that includes a pre-filter, medium filter, BioGS HEPA filter, carbon filter and a customised filter that allows you to adjust the product to suit your needs by choosing between enhanced germ defence, toxin absorption, pet allergies or odour elimination, and an ion generator which creates an ionic field to neutralise airborne contaminants without producing ozone. It also is aesthetically appealing as it comes in a variety of styles and colours. The drawback is that it is more expensive than the Winix. The unit is extremely quiet, even working at full speed. One said it was quieter than his fridge! Many report being very satisfied with the quality of the device. It is reasonably priced compared to similar units on the market. The filters are cheaper than those of comparable models and are easy to clean or change. The sleek design is a space saver. The sensor that controls the operation in automatic mode is extremely sensitive and reacts quickly to the level of pollutants it has to clear. It clears the air so effectively that people report feeling healthier, even having fewer sinus problems and sleeping better and feeling a difference when they wake up in the morning. Pets are comfortable with the sound of it operating. On the minus side, one reviewer said the unit suddenly stopped working after only a month-and-a-half. This air purifier is good value for the money. Comparable models are more expensive (see alternative model above). You can control your unit manually as the 5300-2 gives you several options with its four settings: Low, Medium, High and Turbo. This can save energy and costs, as you can set the fan to the level required. It can also be operated in automatic mode. According to users, the filters cost less than those of comparable air purifiers. This air purifier is very easy to use. It has a smart sensor that gauges the air so that the auto mode can adjust the fan to filter the air as required. It sets itself to deal with heavy or light pollutants without the user having to adjust it. It also has a sleep mode, which is easy to set for silent night-time operation, ideal for light sleepers who are easily disturbed by noise. This air purifier, with its True-HEPA filter, is very effective as it captures 99.9% of airborne pollutants, dust mites, pet dander, pollen and other allergens as small as 0.3 microns while its 3-stage cleaning process removes dust, odours, cigarette smoke, mould spores and organic chemicals. The True-HEPA filter is the highest standard air filter you can get. To carry this label the filter must meet strict regulations set by the United States Department of Energy (DOE). It is key in producing clean, pure air. Winix Inc. was established 40 years ago, in 1973, with the goal of providing clean air and water. The company is constantly in pursuit of “next generation” technology and quality engineering leading to aesthetically pleasing, user friendly and powerfully effective products. They have a rich history of innovation and their uncompromising ethical standards are second to none. The air purifier’s PlasmaWave technology produces no harmful ozone and acts as a permanent filter to safely break down pollutants and allergens. The LED indicator displays the quality of the air around it, which it constantly monitors, from good to poor (1-3). When the unit senses a quality change, it automatically adjusts the speed at which it is running to create clean air. The Winix 5300-2 will even let you know when it is time to change the filter. This is an ideal air purifier for home or office use, suitable for medium or large rooms, bedrooms and children’s and babies’ rooms.